The Bank of England on Wednesday raised concerns about the growth in so-called leveraged loans – credit given to risky companies by private lenders. The British central bank is not alone in being alarmed. Australia’s central bank and the Bank of International Settlements have also noted the soaring use of leveraged loans, which now stand at more than $US1 trillion. The central banks of both the UK and Australia have raised red flags about the rapid expansion of so-called leveraged loans and associated products that have invited comparisons to the toxic debt vehicles that triggered the global financial crisis. In documents published just days apart, the Reserve Bank of Australia and the Bank of England expressed clear concern at the growth in leveraged loans, which have doubled in issuance since the crisis and now stand at over $US1 trillion. In addition, official statements from both central banks over the past week noted a weakening of lending standards for leveraged loans as the market ballooned. Australia’s central bank said this brought “additional risks,” while Britain’s central bank now intends to include leveraged loans in its stress tests that model the ability of the financial system and the economy to withstand major shocks. Major investors are also starting to warn about the lending products and their associated weak lending standards. 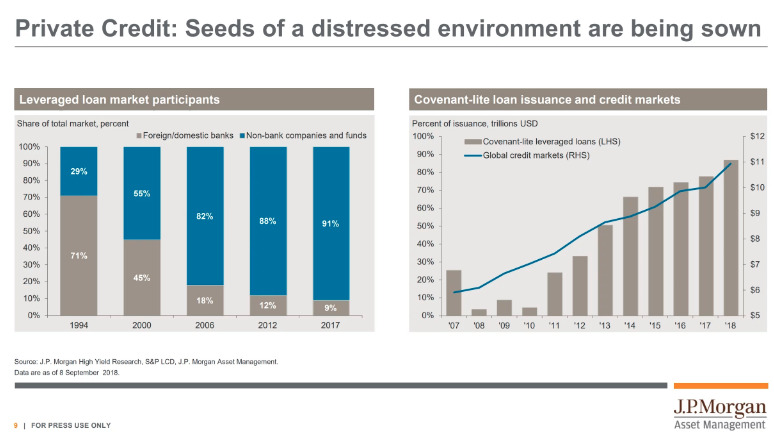 In a presentation in London attended by Business Insider last week, Anton Pil, the head of JPMorgan’s $US100 billion alternatives investment arm, noted that private credit markets had “exploded in size” over recent years. J.P. Morgan Asset ManagementJ.P. Morgan Asset Management. Leveraged loans are typically issued by nonbank lenders to companies that are risky borrowers or already highly indebted. The Reserve Bank of Australia noted there had been particularly strong demand for leveraged loans from special-purpose vehicles that repackage them into collateralized loan obligations to sell to investors – spreading the exposure further across the market. The private loan market is largely unregulated relative to conventional bank lending, and as investor appetite for risk has remained strong in recent years there has been increasing issuance of private loans that offer much more limited protection to creditors in the event of default – or sometimes almost none. The concerns from the two central banks come just weeks after the Bank of International Settlements, also known as the central bankers’ bank, published research on leveraged loans last month. The BIS noted default rates on the products had started to tick up – albeit only slightly – in the US, but it added that the US Federal Reserve’s steady tightening of monetary policy could put further pressure on the system, because the interest rates on leveraged loans are typically floating relative to benchmark Treasury rates. “Non-financial corporate debt, relative to GDP, has been little changed in advanced economies in aggregate over the past few years. But in some countries, such as the United States and Canada, it has been rising strongly…. Firms with higher debt are more vulnerable to negative shocks; with a larger share of their profits used to pay their debt obligations, they are less able to withstand adverse shocks to profitability or interest rates. “In the United States, riskier commercial borrowers are among those to have increased their debt. In particular, leveraged loan issuance (loans to non-investment grade or already highly levered firms) has risen faster than aggregate debt in recent years, while high-yield bond issuance has remained at a high level. There has been particularly strong demand for leveraged loans from special purpose vehicles that repackage them into collateralized loan obligations (CLOs) to sell to investors. More than half of total leveraged loan issuance is purchased by CLOs. This may pose some additional risks, as securitized loans can be opaque for investors.